FalCon QuickView DB is more than a product, it is a concept. It consists basically of two separate programs, a database server and a client program. The features offered by the server include automatic data backup, CD burning, access protocols, access protection, automatic data importing and much more. 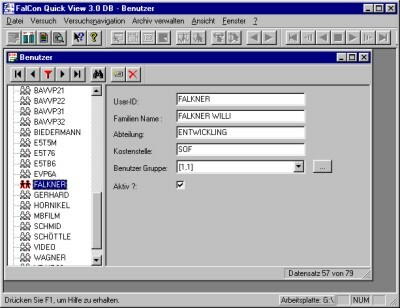 In addition to the functions familiar from FalCon QuickView (picture processing, picture optimization, AVI creation and compression, synchronized representation of measurement graphs and AVIs), the client receives additional functions for managing the archive, performing tests, controlling cameras and transferring picture data from the camera to the host, not to mention one of the most important features, a "Navigator". 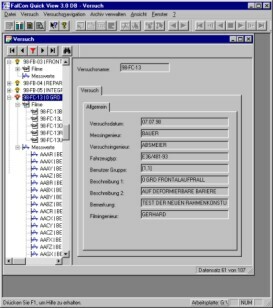 This Navigator is the interface to the database, and can be used to perform searches. 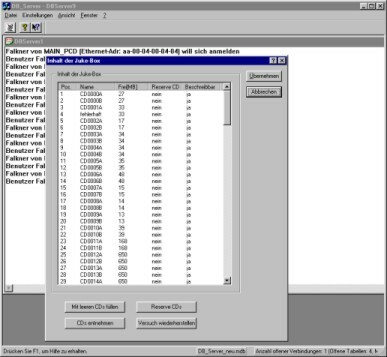 The Navigator window is divided into two sections: the left side contains a tree structure of the selected tests/film/pictures/measurement data, while the right side contains additional information related to the item selected on the left side. 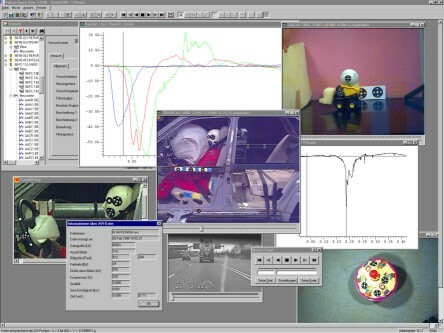 To display the films/pictures/measurement graphs, simply double-click or drag with the mouse. Another very convenient feature is performing tests with camera control: you can set parameters for, monitor, or download from as many as 255 cameras in parallel. Once the test has been performed, all you need to do is click with the mouse and the system works automatically for you: transfer of picture data from the cameras to the host via Ethernet with simultaneous creation of AVIs, transfer of data to the server and compression of the AVIs. The server in turn backs up the data automatically on CD – depending on the capacity of the CD changer, you will only need to become involved very infrequently (typically twice a year); otherwise, everything runs automatically. More than a program: an integrated concept! Store the data on CD (each 2 copies). Store the data base and data on different computers. Organize the users into groups with different access rights. Manage the data access of client PCs. Import measuring data via mail box (also possible manually). Transfer data to the user stations. Register users and approved workstations. Grant group/user-level rights to access each tests. Transfer image data from the cameras to the host (via network).